You can start using Studio by logging in and visiting the Studio homepage in the Twilio console. You might have a Transition based on the condition of an incoming message; you could handle specific text inputs and route them to a Split Based On... Widget. An Execution represents a specific person’s run through a Flow. An Execution is active while the user is in the Flow, and it is considered ended when they stop or are kicked out of the Flow. 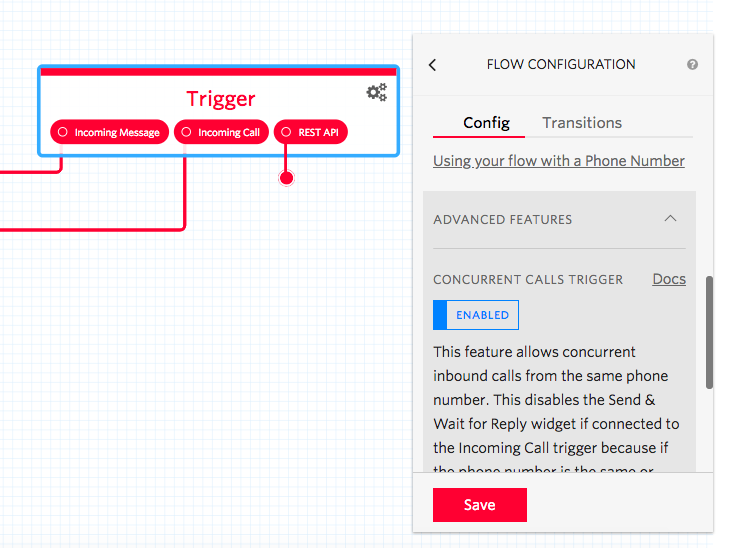 When I call the Twilio number connected to a Flow, an Execution is created to represent my call to that number / path through the Flow. The owner of the Flow can see my Execution, as well as the Executions of other users who have run through the Flow. Log data is persisted in Studio for 90 days after an execution ends. This relates to all execution step data persisted by the application. Data relating to underlying products used via Studio, such as SMS or voice call logs, are not automatically deleted at the same time as execution data. Data generated by other products is retained / deleted in line with those products data policies. Details of individual product data retention policies can be found in the specific product documentation, such as here for SMS and here for voice calls. Note: This functionality changed on October 1st 2018. New flows created after this date will handle concurrent calls from the same caller ID by default. For flows created before that date, the switch must be made manually in the call trigger (see screenshot below). 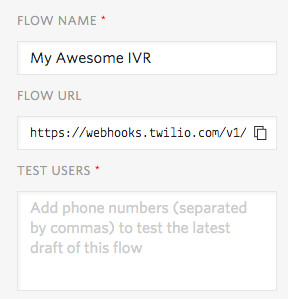 By default, Studio flows can handle inbound concurrent calls from the same number. The Send and Wait For Reply widget cannot be attached anywhere downstream of the Incoming Call trigger point. This is because if multiple users are calling from the same number, Studio can't uniquely text back one user in an active execution and correctly identify a reply, because callers all share the same number. For certain specific use cases, where you know callers to a Studio flow will always have a unique visible caller ID, you can disable the concurrent calls mode via the Advanced Features dropdown in the Trigger widget (see below). When disabled, you will be able to add the Send and Wait for Reply widget to incoming call trigger connected flows. This is only recommended for advanced users who know that their flow is triggered from visible unique caller IDs. Note: Concurrent Calls does not apply to Executions triggered by an Incoming Message or the REST API. Those trigger types can only handle one concurrent Execution per Contact to ensure each session is uniquely tracked. Keyboard shortcuts are available if you'd like to duplicate widgets on the canvas. Simply select a widget (it will highlight in blue) and then copy (Cmd + C on Mac or Ctrl +C on Windows) and paste (Cmd + V on Mac or Ctrl + V on Windows). To remove a Transition, click on the widget that starts the Transition and drag the line away. 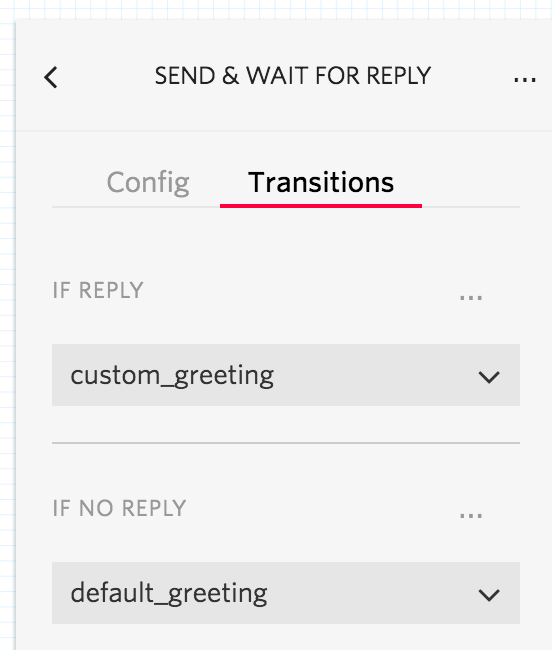 You can also click on the widget, select the Transitions tab on the configuration pane and click on the "..." next to the Transition you would like to remove, then click on the Disconnect Transition option from the dropdown menu. All three of these appear in the Trigger Widget, and you can drag-and-drop from one or more to reflect the needs of your use case. 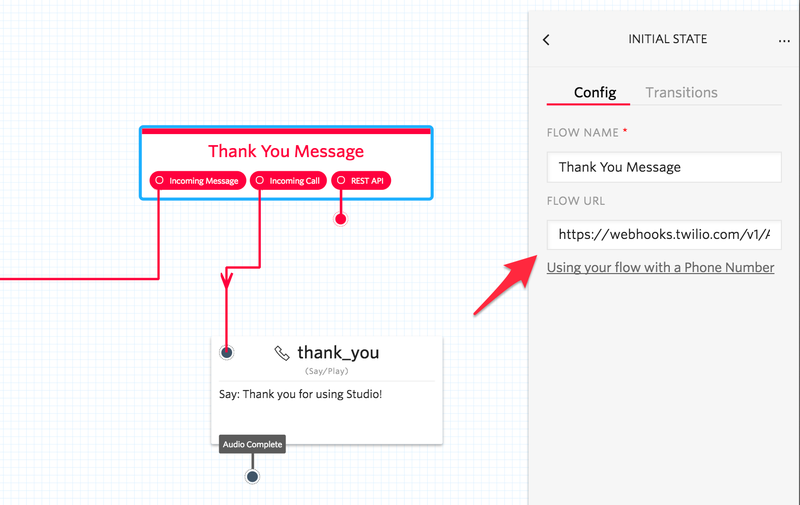 The Incoming Message trigger is invoked when your Twilio Phone Number (or other message-based channel) receives a new message and sends it to your Studio Flow Webhook URL. By connecting Send Message or Send & Wait for Reply widgets, you can respond to those incoming messages and carry on a conversation with the Contact. Studio maintains a unique session based on the Contact's identifier (usually a phone number). For a messaging Flow, Studio only allows a single active Execution per Contact. Thus, all messages from the Contact to that Flow during an active Execution will be handled by that same Execution. 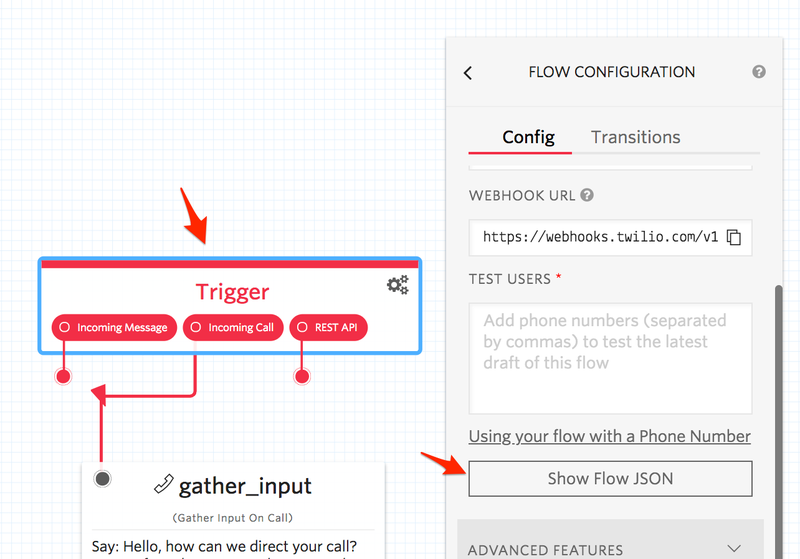 The Incoming Call trigger is invoked when your Twilio Phone Number (or other voice-based channel) receives a new call and sends it to your Studio Flow Webhook URL. By connecting voice widgets, such as Say/Play and Gather Input, you can guide the Contact through a series of interactive voice responses (IVR) and even connect the Contact to another party with Connect Call To or route them to Record Voicemail. By default Studio maintains a unique voice session based on the combination of the Contact's identifier (usually a phone number) and the unique Call SID, ensuring every call is handled uniquely, even if concurrent calls use the same Caller ID. Using the Studio REST API, you can trigger an outbound call or message to a Contact. Use this trigger type to initiate appointment reminders, surveys or alerts from your own application. Add widgets to the REST API trigger to control the conversation just as you would for Incoming Message or Incoming Call. For outbound voice calls, use the Make Outgoing Call widget to initiate the call; for oubound messages, use either Send Message to fire and forget or Send & Wait for Reply to initiate a two-way conversation. Studio maintains a unique session based on the Contact's identifier (usually a phone number). For a REST API Flow, Studio only allows a single active Execution per Contact. If an Execution is already active for a Contact, a new REST API request for that same Contact will simply return the existing Execution. Tip: Be sure the To and From phone numbers are formatted as E.164 (e.g. +1xxxxxxxxxx) to ensure correct session tracking. See the Studio REST API docs for more details. You can also copy-paste the Webhook URL onto any Twilio resource that takes a callback URL, including Messaging Services, Short Codes, and Channels. Depending on the product, this can be done in the Console, via API, or both. Note: A Twilio phone number can only route inbound messages and calls to a single Studio Flow (one-to-one), but that Flow can process messages and calls from multiple phone numbers (one-to-many). 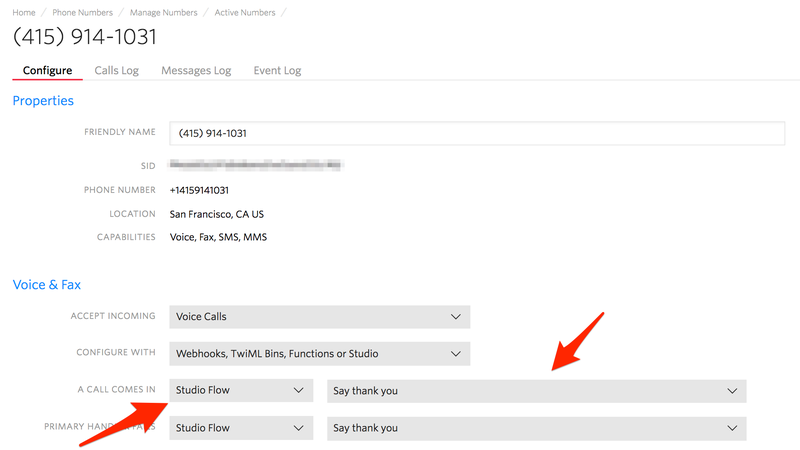 Important: For Voice Flows, add the Studio Flow Webhook URL to both the Call Status Changes and the Primary Handler Fails fields to ensure Studio can always correctly detect the end of the call. Now, try calling the number in the screenshot -- if you hear a message referencing this guide, it’s powered by a Studio Flow! Note the casing of variable names, and remember that widget names must be unique, must start with a letter and cannot include spaces or additional periods. Any variables that come from an external source, such as a status callback or Twilio API call, are cased according to the relevant spec for that callback. For example, an incoming message will have a "Body" parameter, where we keep the capitalized "Body" like in the Twilio SMS API. Variables specific to the flow, trigger, and widgets context are lower cased. Note: This functionality has recently been updated. Previously, Flow edits published automatically for users on the Studio starter plan. We've now added the below Draft/Edit functionality for all Studio plan users, including the free Starter tier. Changes are automatically saved but will not be made live for consumers until you explicitly click "Publish". This lets you safely make changes and when you're happy with the final product, publish them for everyone. Studio also includes Revision History. You will be able to see a list of every change made to your flow and the differences between the currently published version and the latest draft. Testing draft flows is easy with Studio -- you just need to whitelist your phone number to go through the latest draft version instead of the published version. Click the Trigger widget and you can add as many phone numbers as you would like, separated with commas, to experience the latest draft version of the flow. To change the name of your Flow, click on the Trigger widget. The right-side configuration panel includes a field for Flow Name. Enter the desired name, and click Save to rename your Flow. To make a copy of an existing Flow, navigate to your list of Flows and locate the one you'd like to copy. 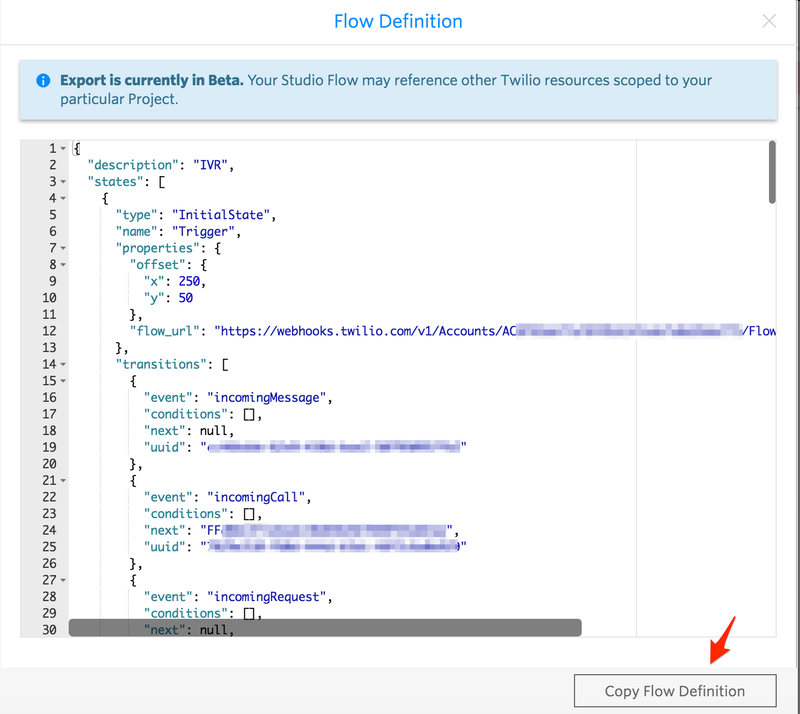 Click on Duplicate Flow and a new copy of the Flow will be created and automatically opened. If you'd like to delete a Flow, navigate to your list of Flows and locate the one you'd like to remove. Click on Delete Flow to remove the Flow. Caution: Deleting a Flow is not recoverable. If you delete a Flow that is being used in production to handle calls or messages, you will need to rebuild the Flow to restore service. 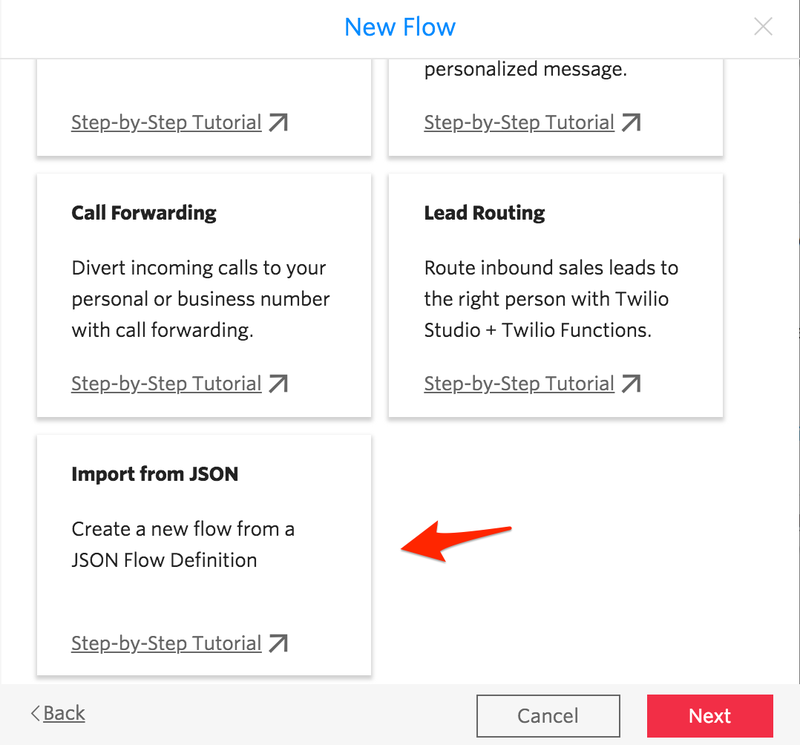 Use this functionality to export flow definitions as JSON and import them to other Twilio accounts. It's best to use Duplicate flow for simply creating a copy of a Flow in the same account. Import / Export of Flows is intended for exporting a flow to store elsewhere, .e.g. source control and/or to move flows between Twilio accounts. 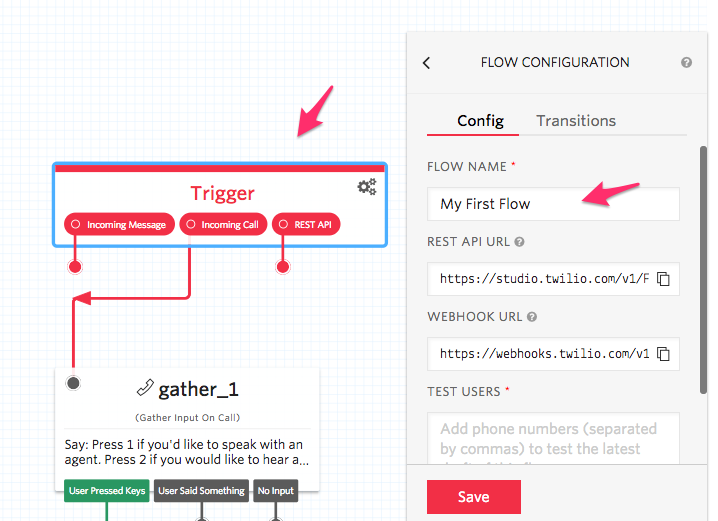 Your Studio Flow definition may reference other Twilio resources (like phone numbers, Functions, etc.). These references are not automatically copied when the Flow is imported to another account, and you may need to make manual updates to your Flow to refresh references to those resources. 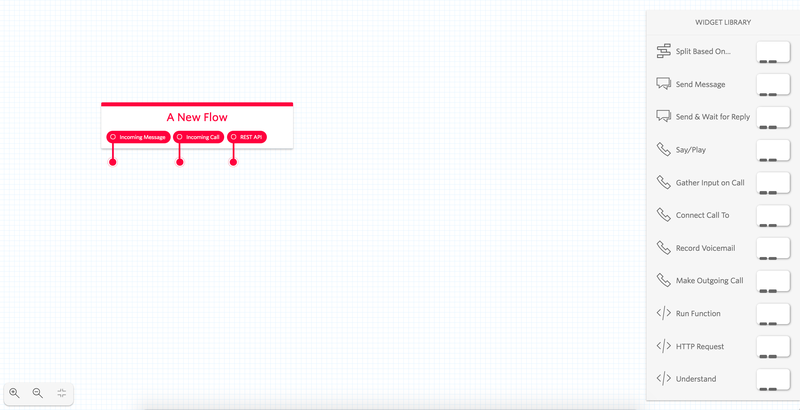 Click on the Trigger widget and select Show Flow JSON. This will display the JSON data that defines your flow. You can copy this data out and store it elsewhere. 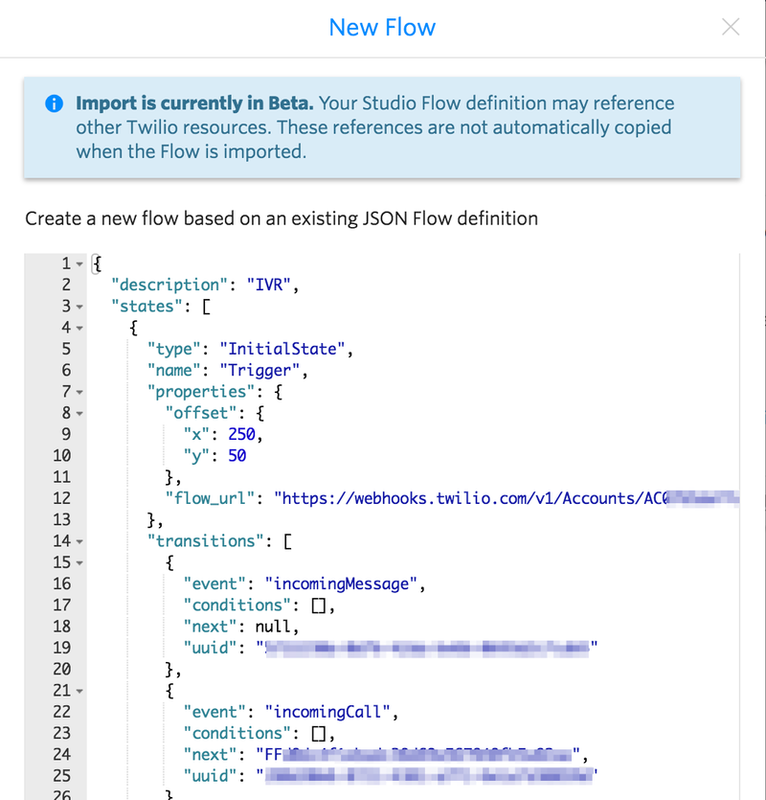 Create a new Flow, and select Import from JSON. Click Next. You will be presented with a code window to paste valid Flow JSON. Click Next to create the new Flow once the JSON definition is added. Sometimes Executions become stuck for Inbound Calls. Follow our best practices to avoid stuck Executions. Infinite loops are possible! We have a built in limit, so your flow won't go on forever -- it will stop on its own eventually. But be careful whenever making transitions that loop back to themselves. Returning custom TwiML from an HTTP Request widget isn't supported. Instead, follow this guide for returning custom TwiML from a Run Function widget.